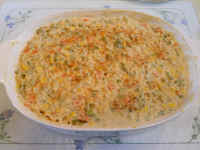 We usually make our tofu scrambles in our wok but, for this recipe, we baked it into a casserole in our microwave oven in a large covered ceramic baking dish, but it can also be baked in a conventional oven at 350 degrees F. It's great for a main meal, for breakfast, and in sandwiches. Even though there are only two of us, we usually prepare a larger batch of food so that we have leftovers for a day or two (which, by the way, are very good), so that we don't have to cook every day. If you wish to make a smaller amount, cut the recipe in half. I you are making your own tofu, begin by making it and, while it is cooking, follow the directions below; otherwise, just follow the instructions below. Begin by washing and peeling the carrots and onions, and washing the broccoli, celery and jalapeño pepper. Dice the onions and celery, and place in the covered baking dish. The carrots can be shredded or diced, and the jalapeño pepper should be finely chopped before adding to the covered baking dish (or add hot sauce as desired). Cover and bake until the onions become semi-translucent. Mix occasionally to ensure uniform cooking of all the vegetables. 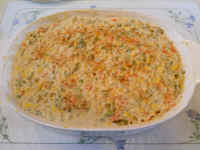 Add the oregano, corn, broccoli, and peas to the baking dish, cover and cook until all the veggies are tender, mixing occasionally. While the veggies are cooking, place the tofu, nutritional yeast, turmeric, and soy sauce in the container of a high speed blender (if you are using freshly made tofu, don't forget to add the cornstarch), cover and run the blender at high speed until the contents are smooth. When the veggies are cooked, add the tofu blend, mix well, and continue cooking until the tofu is hot, which takes about 5-10 minutes. Leftover tofu scramble can be safely stored for 3-4 days in a covered container in the refrigerator. Cold tofu scramble also makes a great pita bread or tortilla stuffer.